For more than 3,000 years, civilizations in every corner of the world have documented the powerful effects that herbs, plants, roots, tree bark, leaves and flowers (the botanicals) have on human well-being. 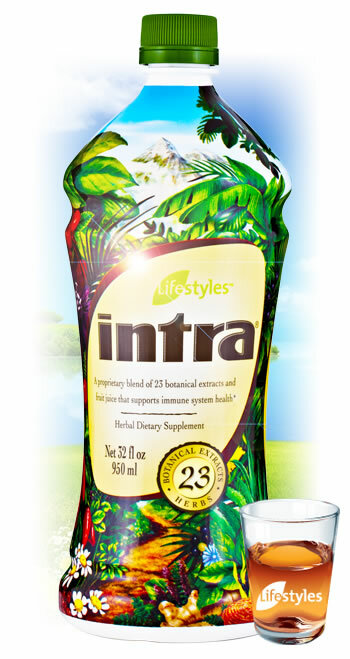 Intra is a pleasant tasting, proprietary formulation of 23 time-tested and trusted botanical extracts. The key to Intra's effectiveness is the synergy of the blended botanicals working together. Intra's unique formula is exclusive to Lifestyles and has remained unchanged since 1992. As a concentrated botanical beverage, Intra's precise formula of 23 botanical extracts work better together. Intra is certified Safe for Athletic Use by the international Olympic Committee because it does not contain steroids or stimulants.